Your executive staff has made a strategic decision to move to the cloud, and your team has the seemingly monumental task of executing on this new direction. The journey to the cloud introduces many unknowns, the least of which is determining the applications and data, including precious customer information, that belong in the cloud. Yet your knowledge is limited and you have little time to immerse yourself in this vast topic. Join us for the the Cloud First, Now What? webinar hosted by Cloud Security Alliance and sponsored by Palo Alto Networks. In this webinar, we will walk through the process by which your company should implement a cloud first strategy. 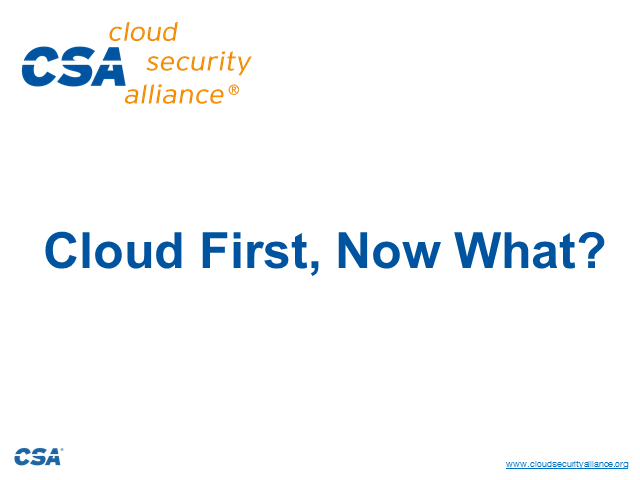 Title: Cloud First, Now What?